Microelectromechanical systems (MEMS) has been able to successfully acceded to several markets, including pressure sensors, gyroscopes, accelerometers, fluidics and data storage, representing a total revenue of some $2 billion in 2000. However, MEMS has the potential to offer reliable and cost-effective solutions to many other fields. The current expectation is that we will witness the appearance of diverse MEMS structures for power generation, propulsion, biomedical applications, optical switching, infrared sensing, microphones and displays, to name just a few. This plethora of activity is possible due to the increased understanding of the properties of the micromanufacturing materials involved, the availability of processing equipment with enhanced capabilities, and the effort of a large number of researchers and scientists. This book, first published in 2002, focuses on the materials science of MEMS structures and the films involved to create those structures. Topics include: applications metrology; mechanical properties; microstructure and processing; applications; processing techniques; alternative materials; and surface engineering issues in MEMS structures and devices. 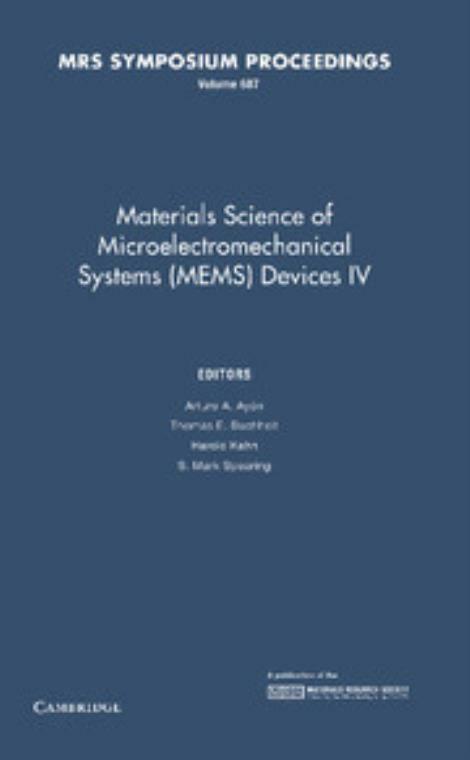 Part X - Surface Engineering Issues in Mems Structures and Devices; Author index; Subject index.